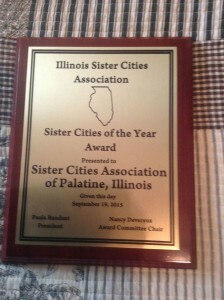 The Palatine chapter of the Illinois Sister Cities Association was named the 2015 Sister City of the Year for its relationship with Fontenay-le-Comte, France by Illinois Sister Cities Association. It is the third time the Village has received the honor, the first time being in 2003 and the second in 2010. Palatine has been Fontenay’s sister city for 20 years and participates in travel, business, culinary, art, and sport exchanges as well as respective projects with the French community. Sister Cities is a nonprofit organization started in 1956 by President Dwight Eisenhower, who wanted to encourage citizen diplomacy. There are more than 40 Illinois municipalities partnered with 90-plus cities throughout the world.